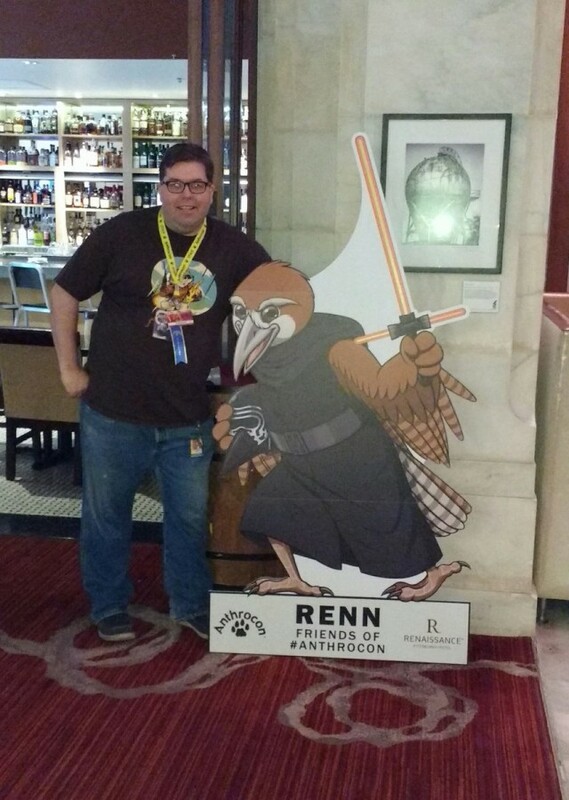 Anthrocon 2016 and the Friends Of Anthrocon project! So it all started with a convention I didn't go to. The Hyatt O'Hare, hotel of Midwest Furfest for 2015, wanted to join in the fun of a furry convention, and did so by putting a fox kigurumi in their lobby. Unfortunately, more of the reactions to it I saw on twitter were "Enh." 'Sad." "Creepy." But there was the germ of a good idea involved in this.. and I pondered a lot. 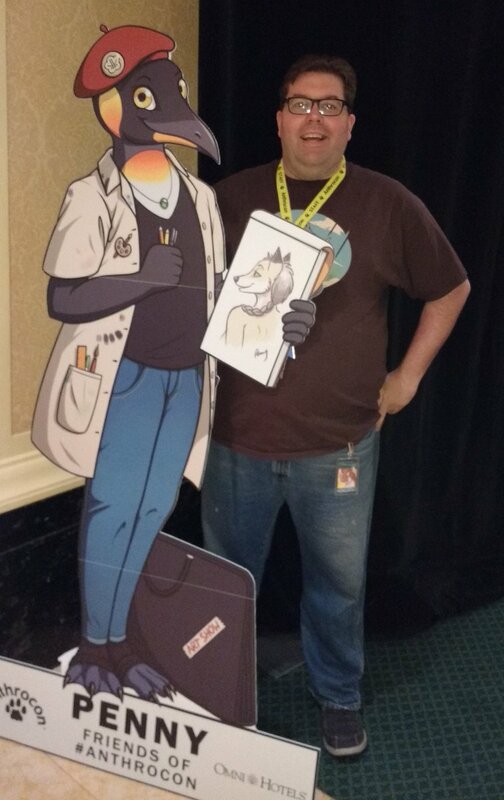 And at Anthro New England, I pounced on Mary "Moth Monarch" Capaldi with the idea: to give Anthrocon's partner hotels each a fursona of their own, printed on a carboard standee. 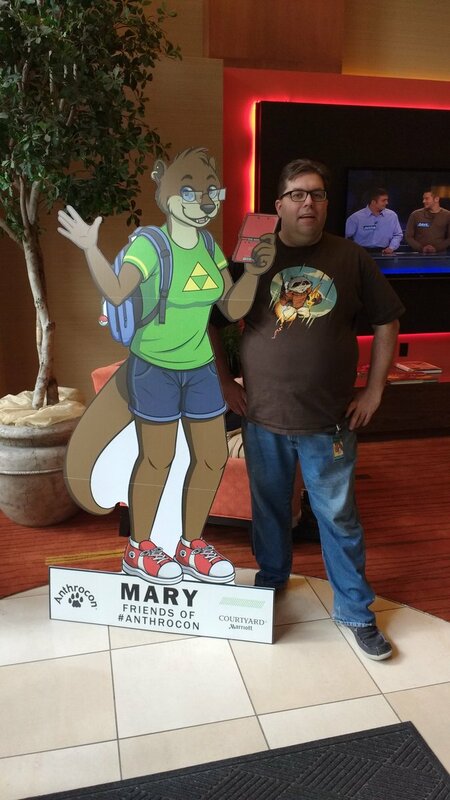 As Mary had just been made Anthrocon staff, this was the perfect task for her artistic talents.. and we set to work. Board approval was quickly given, and we contacted Kristen Turner at VisitPittsburgh to help contact Anthrocon's eight partner hotels. Seven of them signed on, and we were off! Each hotel selected a species, and in some cases the name, of their fursona. Mary and I worked to give them each a unique identity and personailty: Westie (Westin) was an West Highland Terrier as a friendly everyman, while Dub (Doubletree) was a DJ squirrel in Tripp pants. 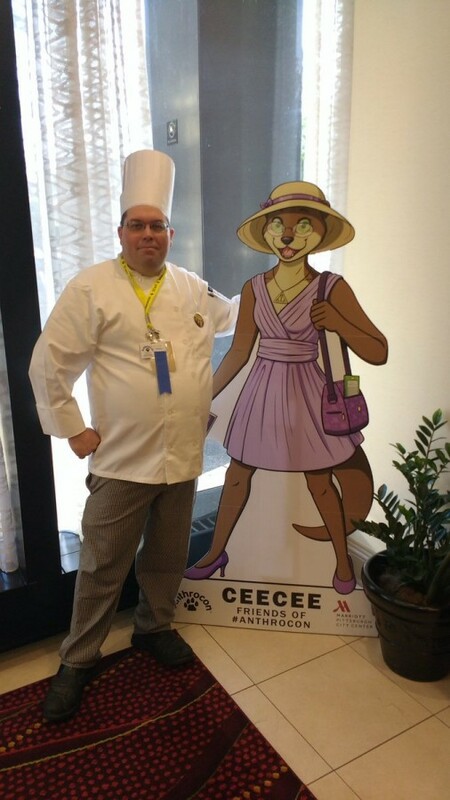 We worked hard to balance gender and body types to make sure it was a diverse crew, much like Anthrocon is. And the social media explosion we were hoping for began. People taking pictures of and with the standees, and posting them to Twitter and Instagram. 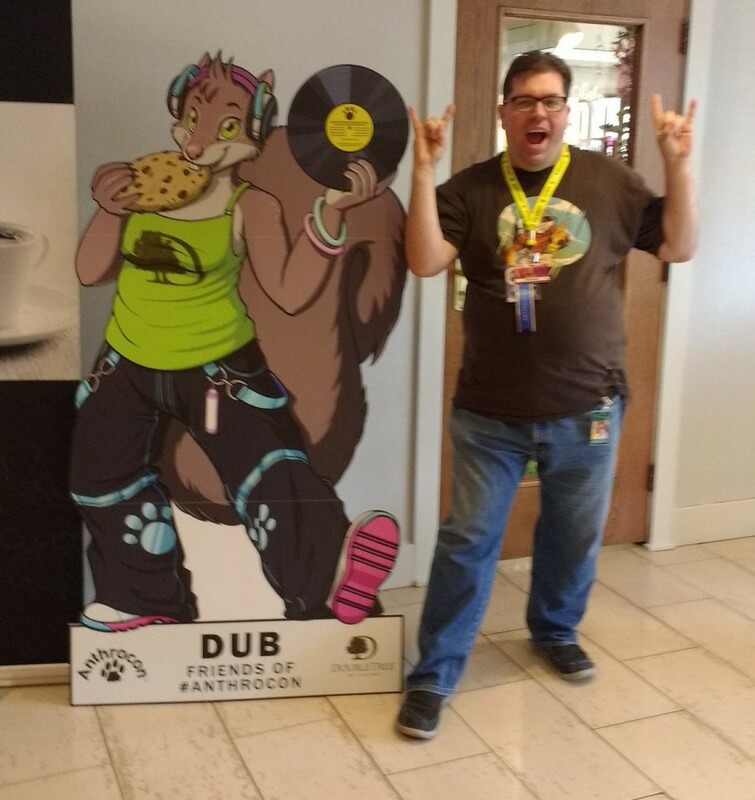 They kept discussing which the best ones were, groaning at the punny name of "Mary Otter" for the Marriott, and fan art of Dub appeared during the convention. The hotels themselves enjoyed having them-- at one meeting with the hotel reps, the Doubletree rep said "We love her. I would fight for Dub." 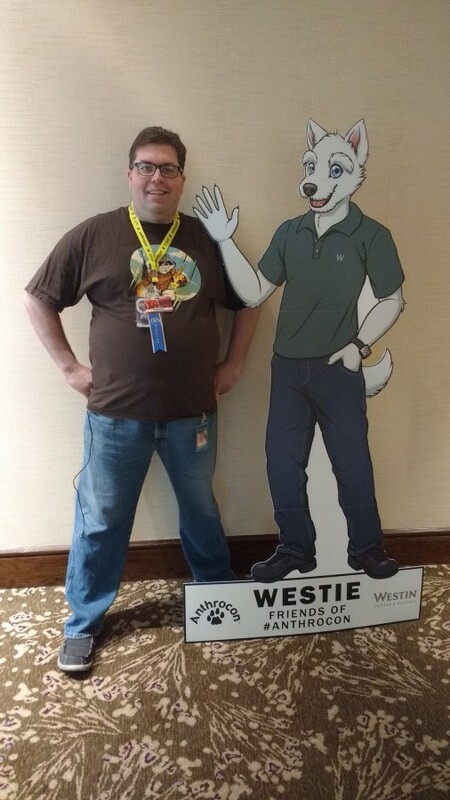 And when the Wyndham Grand rep asked where their standee was, and were told 'Your hotel was asked, but declined to participate.." The "oooooh!" of shame in the room was delicious. They're on board for next year, now! There were subtler effects, too. Hotel damage reports were lessened, and the overall interactions with Anthrocon attendees and hotels were positive- they recognized this project as local support, somethign Pittsburgh has given to our Anthrocon like no other city has done for a furry convention. 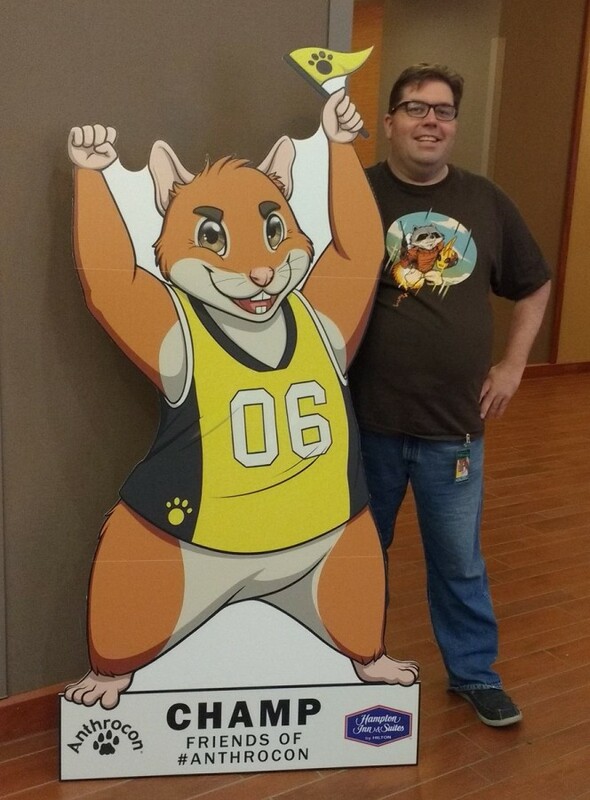 It's another way that Anthrocon and Pittsburgh support and appreciate one another. I'm justifiably proud of how this project went. My thanks to Kristen Turner of Visit Pittsburgh for help with the hotel co-ordination. our partner hotels for joining us in this, Karl "Xydexx" Jorgenson for co-ordinating with the printer, lifesizecustomcutouts.com for doing the printing and cutting, and most especially Mary Capaldi for her hours and days of work on the art and design.. She's the one who was able to take this project from wacky idea to amazing reality, and she completely earned her staff badge in the process. Read her post about it, and see the all seven characters, here. So whenever you doubt your ability to accomplish things, whenever a project seems impossible, just remember: there's a hotel in Pittsburgh that six presidents have stayed the night in, and a buffet cook and self-employed artist convinced them having a 6-foot-tall anthropomorphic penguin in their lobby was a good idea. It's possible. That's awesome, those turned out great! I think Dub's my favorite, I like how DoubleTree's famous cookies got worked in. Is CeeCee (city center? That's cute!) Mary's sister? :D The classy older one, apparently. Those are awesome! I'm partial to CeeCee, myself, although all are great. I'm not surprised people like Dub. She's the clear frontrunner in my book, because she seems to be the best designed and rendered from an artistic and character perspective. I do like Champ as a strong second favorite. Mary Otter was such a groaner pun, but I did get a T-shirt of her. Fantastic idea!